STREETERVILLE — Michael Davis took his first steps this week since an attack in June when he was ambushed and nearly beaten to death with a baseball bat after breaking up a Rogers Park bar fight. Since the brutal assault, friends and family have raised thousands of dollars to help with his recovery. Inside the Rehabilitation Institute of Chicago Monday, Davis, 44, had regained enough strength to hoist himself from his wheelchair and walk on his own. "They like my willpower, my endurance," he said of his physical therapists and nurses. "Thank God. Because I never give up. "In two weeks, I want to walk up my stairwell — and everywhere else. And I want to see friends and family in Rogers Park." Michael Davis, 44, was beaten nearly to death in the 1400 block of West Jarvis Avenue after breaking up a fight at neighborhood bar Poitin Stil, police and family said. 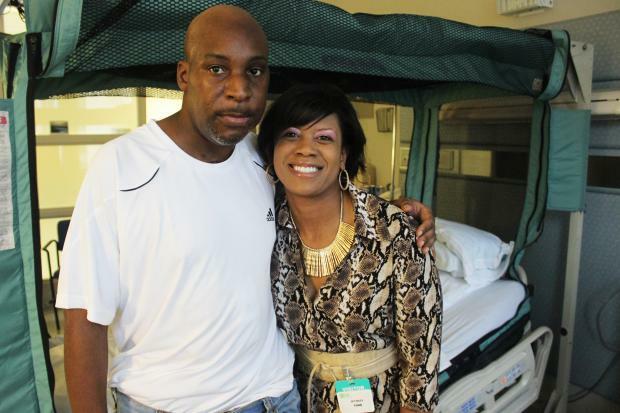 Davis' recovery has "blown away" his loved ones. The June 17 attack in the 1400 block of West Jarvis Avenue left Davis clinging to life. Detectives were amazed he made it through his first night at St. Francis Hospital in Evanston, friends said. Doctors recently removed the breathing and feeding tubes that kept him alive for weeks. Family and friends had been hoping for the best, but didn't know whether Davis would walk and talk or be back to normal. Now he's able to recall names, birthdays and even phone numbers of his closest friends, a good sign for the health of his brain, family says. Yet doctors don't know for certain if he has permanent brain damage. But weeks ago, Davis couldn't move his right side on his own. Now he only has trouble moving the fingers on his right hand and lifting his arm above his shoulder. He struggles, but is able to extend his arm for a limp handshake. "The first week he was in here, he remembered people's phone numbers and was calling people at home," said Alicia Webb, Davis' niece. "He surprised a lot of people." Davis, whose jaw was broken in the attack, was quick to add: "My speech is getting better every day." If his recovery continues at the same pace, they say, Davis could be home within a month. Davis said he remembers the night of the attack, too. "It's a tough pill to swallow, and I don't like thinking about it," he said Wednesday, sitting in a wheelchair he resents. "Every blue moon, it crosses my mind, you know." He remembered the two men who, with a couple of regulars, had started a fight over whose turn it was to rack the pool table. He remembered telling them to lighten up — that "there was no need for all of that" in a low-key neighborhood bar like Poitin Stil. They left, eventually. And so did Davis. "I remember three steps away from my house this guy comes out the bushes with a bat, and talked to me, like, he said a few words — and got to swinging'," Davis said. "And that's all I remember." Police are still investigating the crime, family says. The following weeks, when he was sedated in the hospital, were groggy for Davis, but he remembered friends and family who would come to visit. "My thankfulness, and you know, my thoughts and my love goes to these people," he said. "I love these people like family. They thought of me and they were very concerned about my well-being. "My family, too. They've been my backbone, especially Alicia and my sisters. They've been with me since day one, since I entered the hospital, and I'll never forget that." Matt Nolan, Davis' friend, said he can't wait to fire up the barbecue, like they did every Sunday, and "drink a few beers." "There were so many weeks we’d go visit him, and he was just not there, then all of a sudden," Nolan said, Davis began to improve rapidly. "It’s just staggering," he added. " ... I'm really blown away." 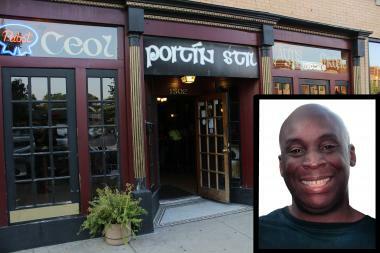 A string of fundraisers were organized to help pay for Davis' recovery, including one at Poitin Stil that netted thousands and another in Bucktown thrown by friends and colleagues of Evanston's Bistro Bordeaux, where Davis worked as a waiter and host. More than $20,000 had been donated online as of Wednesday evening. Another benefit, with music, standup comedy and silent auctions, is planned for Sunday at the Mayne Stage. Davis won't be healthy enough to attend, but says he'll keep fighting. "No, I won't give up and quit. The fight has just begun. It's a whole new life for me," he said. "Spiritually, physically, I'm getting better," he said. "My mind has just come across thanking God I'm still alive. And ... just grateful for the friends and the family that I have in my corner in this difficult time." Davis joked that when he returned home, he'd run for alderman, a position he would use help curb the "madness" that is Chicago's street violence. When asked, he only had one message for his attackers: "Crime does not pay."